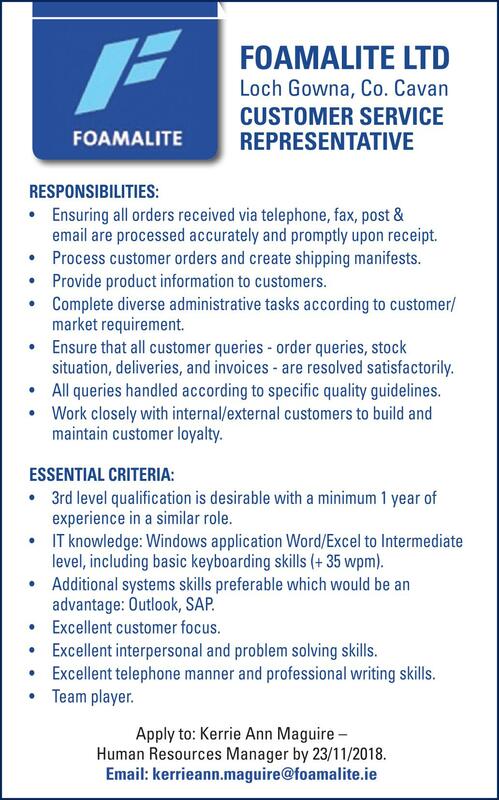 Foamalite Ltd in Loch Gowna, Co Cavan are seeking to recruit a Customer Service Representative. * Ensuring all orders received via telephone, fax, post & email are processed accurately and promptly upon receipt. * Provide product information to customers. * Ensure that all customer queries - order queries, stock situation, deliveries, and invoices - are resolved satisfactorily. * All queries handled according to specific quality guidelines. * Work closely with internal/external customers to build and maintain customer loyalty. * 3rd level qualification is desirable with a minimum 1 year of experience in a similar role. * IT knowledge: Windows application Word/Excel to Intermediate level, including basic keyboarding skills (+ 35 wpm). * Additional systems skills preferable which would be an advantage: Outlook, SAP. * Excellent interpersonal and problem solving skills. * Excellent telephone manner and professional writing skills.